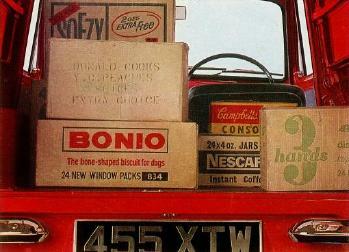 Adverts, Articles, Brochures, Models and Photo's associated with the Ford Anglia 307E Van. The 307E Anglia-shaped Thames van was launched in June 1961. It replaced the side-valve engined vans that had been based on the 100E Popular. There were two versions available: the basic 5cwt and the more "upmarket" 7cwt. The 5cwt had painted bumpers, headlamp peaks, exterior mirrors and radiator grill, whereas the 7cwt had all of these items in a chromium-plated finish. Both vans were quite basic inside, having rubber mats, a drivers seat and no roof headlining. 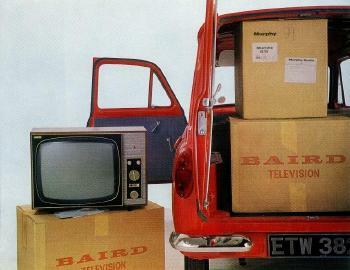 The basic price of the 5cwt van was £369 and the 7cwt cost £399. Both of these prices were for the van painted in primer. The price increased by £10 if it was finished in one of the eight standard colours. The buyer could if he wished, add some optional extras to his van, in the form of a hinged passenger seat, heater and a sun visor. The Anglia vans were available with a choice of either a high or low compression version of the 997cc engine used in the 105E Saloon. Aesthetically, the vans have an attractive appearance, the Anglia front end blending well with the boxy van body shape. Although the vans shared some front-end panels with the Saloon, they were structurally quite different from it. The windscreen is different and is quite a bit taller. The side doors are a completely different shape from those of the Saloon. They are much shorter with the bottom curving upwards towards the rearmost edge. This was to avoid the doors making contact with high pavement kerbs when the van was fully loaded. At the back of the van, two large side hinged doors provided easy access to the generous 61 cu ft load area. This made the Anglia van popular with large and small businesses alike and Ford even provided sample letters for dealerships to send out to these small businesses, extolling the virtues of the new Van. The vans also formed the basis of Pick Up and Ice Cream Vendor Conversions. From October 1962 the 307E became available with the 1198cc engine as fitted to the Anglia Super and became known as the 309E. 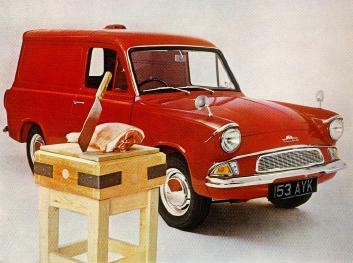 In March 1965, all models of the van were designated Anglia, and the names "Thames" and "Trader" were discontinued.